The state fair is as quintessentially American as apple pies, Ferris wheels, and awarding blue-colored decorative fabric to farmers with the most beautiful livestock -- three things commonly found at state fairs. This is not a coincidence. For the uninitiated, state fairs are like standard town carnivals (featuring questionably safe rides, definitely unhealthy foods, games you can't possibly win, and a general sense of "step right up!" revelry) except way, way, way larger. In fact, if you've never physically been to a state fair, you probably don't fully understand the sheer size and deep-fried grandeur of it all. Some of the biggest can draw literal millions to the fairgrounds every year. It's more Disney World than block party. Presented here are seven state fairs across our fair nation, upon which we bestow our own proverbial blue ribbons. And yes, there will be funnel cake. Pounds and pounds and pounds of funnel cake (sometimes on a stick). And at least one 55-foot-tall cowboy that sometimes bursts into flames. It's all in good fun. It's hard to avoid making a joke about "everything being bigger in Texas," when the Texas State Fair takes carnival ground hedonism and promptly injects it with copious amounts of BBQ, an instantly recognizable, deeply unsettling 55-foot-tall cowboy statue (Big Tex), and -- if that weren't enough -- the tallest Ferris wheel in North America, measuring 212 feet. And, of course, there are enough culinary monstrosities to make your Texas-shaped, studded belt buckle burst. The first and greatest example being the funnel cake bacon queso burger -- which is exactly what it sounds like. And they've continued their tradition of being deep-fried pioneers (meaning, sticking everything with more calories that a Big Mac into hot oil) with recent additions like deep-fried chicken noodle soup and deep-fried Froot Loops -- all part of a balanced breakfast. Oh, and the giant cowboy even talks. And one time, he caught on fire. He is terrifying. One of the only true contenders to Texas' "best and most fried food-stuff" crown (and in some people's eyes, the clear winner), is the Minnesota State Fair. If you look at their official website, under the "food column," they have three options: "new food," "food," and "healthy food." The last clearly being some type of overcompensation, as its world-renowned spread of the least healthy food ever forged by man is the fair's trademark feature. Yes, there are rides. There are big-time artists playing the grandstand stage (Earth, Wind & Fire!). There are the ubiquitous livestock competitions. But you're here to eat things no human should ever consume. Some sample dishes include grilled cinnamon bun sandwiches stuffed with Nutella, marshmallow, bacon, and peanut butter (the four essential food groups). Waffle bowls, with bacon, cheese, hash browns, and eggs. Deep-fried licorice. And yes, even deep-fried avocado -- which is the reason millennials can't buy a house and need an extra belt loop, apparently. Here to prove all this fairground hedonism isn't exclusive to America's heartland, the Great New York State Fair is a 13-day festival on the shores of Onondaga Lake, that draws more than a million visitors annually and features enough rides, food -- and in this case, 800-pound butter sculptures and drone film festivals -- to make the Empire State proud. This fair, in particular, puts a focus on celebrating local cuisine with its Taste NY local business initiative, and the now iconic Taste NY Food Truck Competition. This year, trucks like Pinkies BBQ, Cheesed and Confused, and Abbott's Frozen Custard will be vying for the crown, along with dozens of others pulling up, setting up shop, and blowing the diets of hungry New Yorkers. Sample portions start at $3, and in the spirit of competition, it's surely OK if you sample all of them. Summer will be winding down at this point, so you don't really need your beach bod anymore. Touting itself as "the biggest event on the East Coast," West Springfield, Massachusetts' Big E Fair represents all of New England (that's six states, if you're counting at home), and makes sure to portray each equally. On the vaunted Avenue of States, there's full, life-sized replicas of all six statehouses -- it's something straight out of Disney World (well, if Disney World was fascinated with local government instead of princesses). But it's not all about small-time politics. The Big E is known across New England as one of the most anticipated food events of the year. The trademark dish of the festival is assuredly the decadent Big E Cream Puffs -- but they aren't a one-hit wonder. Fried butter balls, Ultimate Cowboy Nachos, and the -- controversial -- BBQ brisket sundae round out the list of must-try items, making sure Massholes get just as much deep-fried American excess as everyone else this summer. They deserve it. If you've ever had the pleasure of visiting Wisconsin, you probably picked up on a couple things: first off, they have a borderline dangerous affinity for their Green Bay Packers. Secondly, they like to eat. While you are sure to see some Aaron Rodgers jerseys floating around Wisconsin's State Fair, you will definitely see copious evidence of their affinity for cheese, meats, and deep-fried delicacies -- with more than a hundred vendors hawking everything from deep-fried cheese curds (a Wisconsin trademark), spaghetti and meatballs on a stick (Iowa, eat your heart out), and frozen bananas dipped in chocolate. 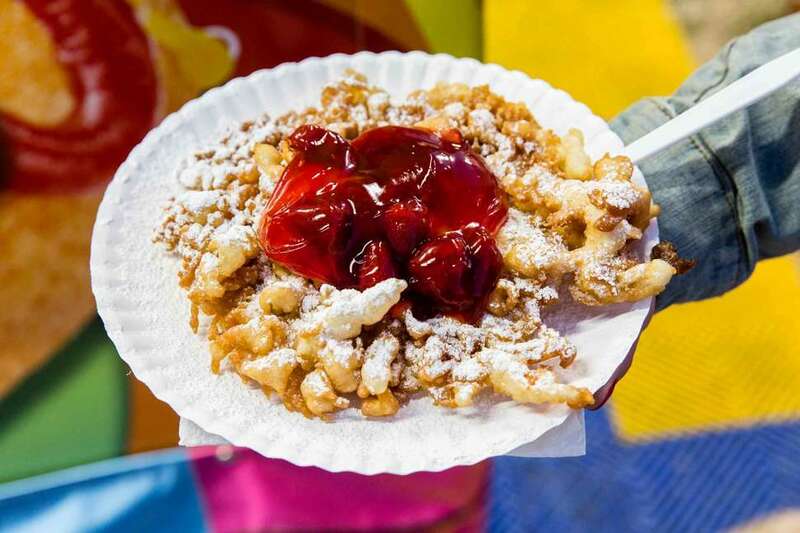 This State Fair separates itself from the pack, however, with its splay of "exotic" food. You have alligator legs. Fried bugs. And -- for the truly adventurous -- Rocky Mountain oysters. Yes, those are cow testicles. OK. I know what you are thinking: How did a measly county fair slip its way onto this list of bona fide state fairs? You are not hallucinating: The San Diego County Fair draws more than 1.6 million annual visitors, and -- despite not being an official state-wide event -- is probably the West Coast's best answer to state fair revelry. There are separate wine, beer, and cocktail festivals within the festival. The fair itself has a palatial, seaside view of the Pacific Ocean. There's petting zoos, rides, performances from bands like Sugarland and Hanson (mmmbop!) and of course -- copious amounts of food. Don't expect kale juice ad nauseam just because you are in SoCal. Fried fish kabobs, kettle corn with M&Ms, and deep-fried filet mignon are just some of the traditionally hedonistic festival fare you can expect at the SDCF. And if you like your lunch Instagram ready, there's an entire festival competition just for "Unicorn Food." So get your filters prepped, and your pants adjusted accordingly. Wil Fulton is a staff writer for Thrillist. Life is his Rocky Mountain oyster. Follow him @wilfulton.